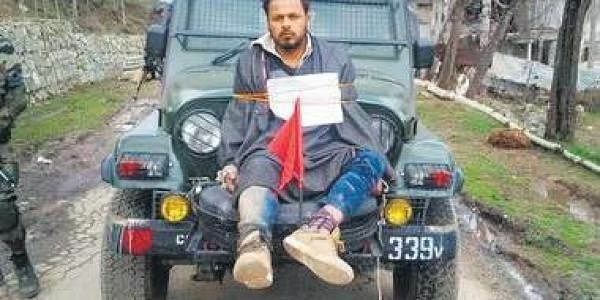 Farooq Ahmed Dar, the "human shield" was tied to an Army jeep and taken around the Srinagar parliamentary constituency during the bypoll on April 9. Major Leetul Gogoi (inset) had tied Farooq Dar to his jeep to ward off stone pelters in Kashmir. SRINAGAR: The PDP-BJP coalition government in Jammu and Kashmir has refused to pay Rs 10 lakhs compensation to Farooq Ahmad Dar, who was used as a human shield against stone pelters by army early this year, as was recommended by the State Human Rights Commission (SHRC). The State’s home department in a communiqué to SHRC has informed that the government’s empowered committee has observed that the grounds on which compensation was recommended to human shield victim by the Commission cannot be accepted due to varied reasons. “No allegation regarding violation of human rights of the applicant has been levelled against the state government or its functionary. The government has discharged its obligation by registering FIR No 378/ 2017 and consequently initiate the investigation,” states the government response to the SHRC. On April 9 when bypolls to Srinagar-Budgam parliamentary seat was held, army had taken 27-year-old Farooq Ahmad Dar, an embroidery artisan, as a human shield and tied him in front of their vehicle and paraded him in several villages of Beerwah in central Kashmir’s Budgam district to prevent stone pelting. Large scale violence had taken place during the bypolls and at least six people were killed and dozens injured in security forces firing during clashes across the central Kashmir. The voter turnout was only 6.5 per cent, which was lowest in past 27 years of turmoil. The human shield incident had triggered outrage in the Valley while Army Chief General Rawat, union ministers and BJP leaders backed Major Gogoi for using Farooq as a human shield against stone pelters. Major Gogoi was awarded by army chief’s ‘Commendation Card’ for his sustained efforts in counter-insurgency operations. After outrage, Jammu and Kashmir police had registered an FIR against the army officer Major Gogoi and SHRC took up hearing of a case after a petition was filed in the commission. On July 10 this year, the SHRC directed the State government to pay a compensation of Rs 10 lakhs to Farooq for being used as a human shield by army. The State government while rejecting compensation to the human shield victim informed the SHRC that there was no scheme of compensation for such cases. “As on date, there is no scheme or policy in vogue in the state which could cover the payment of compensation in the matters like present case,” the government said. The government also questioned the SHRC’s jurisdiction to decide on the matter saying the Commission lacks jurisdiction to entertain and adjudicate upon the present matter. Reacting to denial of compensation, Farooq told reporters, here that although the government had turned down SHRC’s recommendation of granting compensation to him but he was hopeful that one day he would be honoured with justice. He said the incident has mentally disturbed him and he was yet to “fully come to terms”. “I have been facing social stigma after the incident and making ends meet is a challenge for me,” Farooq said. Pertinent to mention here that police investigation has confirmed that Farooq had cast his vote being before tied to the bonnet of the jeep by army men and paraded in dozens of villages.